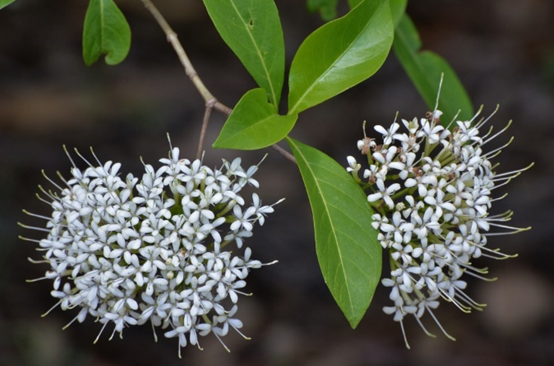 This beautiful shrub is found in drier rainforests in northern NSW and throughout eastern Queensland. Often known as the ‘butterfly bush’, the flowers of the Pavetta attract a wide range of other beneficial insects besides butterflies. Honeyeaters are also fond of the rich nectar. The Pavetta has glossy, longish opposite leaves to 14 cm with prominent veins. The 4-petalled perfumed white flowers are borne in dense clusters at the ends of branchlets in spring and early summer. These are followed in late summer by round black berries to 6 mm, which attract a variety of birds. This is a hardy local shrub or small tree that will tolerate most soils. In cultivation it typically reaches 2–4 m, but can be pruned to keep small. The Pavetta fares best in semi shade (or at least in a reasonably sheltered position) and benefits from mulching. It may shed some foliage in prolonged dry spells, but bounces back quickly after rain. As one of our best wildlife-attracting plants, it deserves to be used much more widely in cultivation and would suit any sized garden. Specimens can be seen at the Samford Eco-Corridor (https://www.facebook.com/EcoCorridor).